If you’re a regular reader of ThingsThatWeDo.com you’ll know I’m not a big fan of shopping. It’s an activity that just doesn’t agree with me. Malls with all the bright lights and noise are just far too excessive in my humble opinion. Now, clothes come and go and your favourites are always the first ones to get tossed because they’re overworked and overtired and show their age far too soon. Enter Scotch Essentials Sweater Pill Remover. My big kid found this for me during one of our random excursions. We were browsing the aisles at one of our local stores and she gives me a poke and a jab towards the Scotch Essentials Sweater Pill Remover. 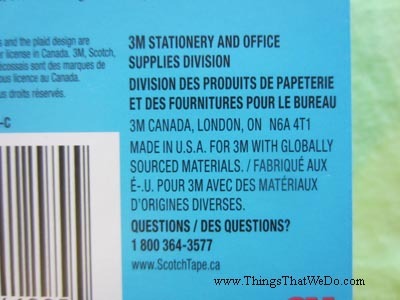 Intrigued, I picked it up and read the box. 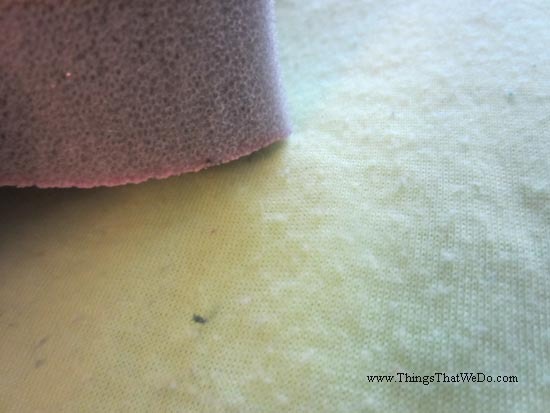 A sweater pill remover? Really? In a box, with no batteries required? It seemed simple enough to use. 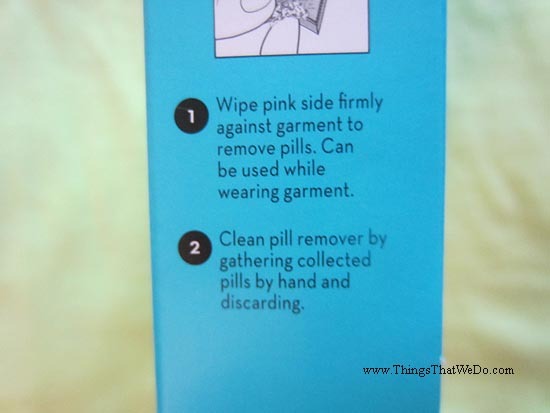 Apparently, all I had to do was wipe the pink side against my clothing of choice to remove the pills. Hm…at best part yet, the Scotch Essentials Sweater Pill Remover cost me less than $4 so why not give it a shot especially if it’ll give me a few more wears of my favourite clothes! Time to test out this little Scotch Essentials Sweater Pill Remover. Now, I have to apologize. I should have actually taken a closer photo of the remover itself but I totally forgot! So, I’ll just have to describe it to you. 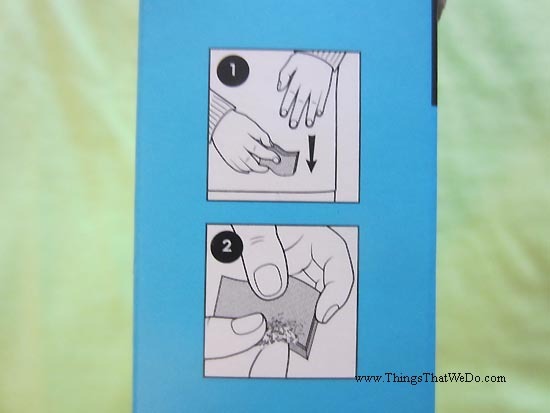 It’s an unassuming little wave shaped sponge that’s smaller than an average pack of gum and fits easily into your hands. 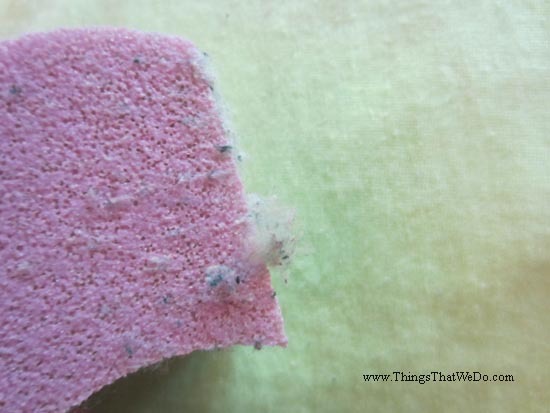 According to the instructions, all I really have to do is wipe the pink side of the sponge on to my chosen piece of clothing and its rough texture should help me to scrape away those annoying little pills. First test: one of my big kid’s favourite t-shirt. 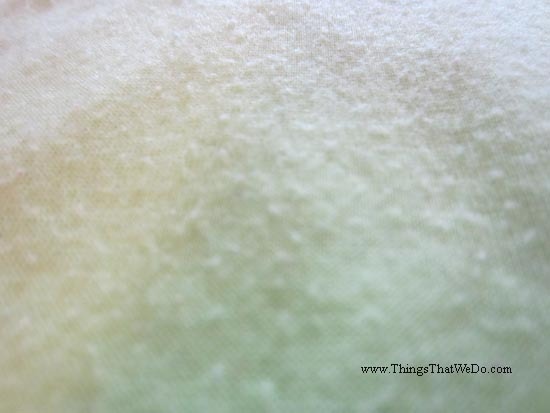 It’s a polyester cotton blend and it’s full of little raised pills. It’s been in the wash far too many times but it’s loved so she’ll often wear it at home. Logic tells me to lay the shirt flat as I gently rub the Scotch Essentials Sweater Pill Remover on to the shirt and sure enough, the pills are coming off! 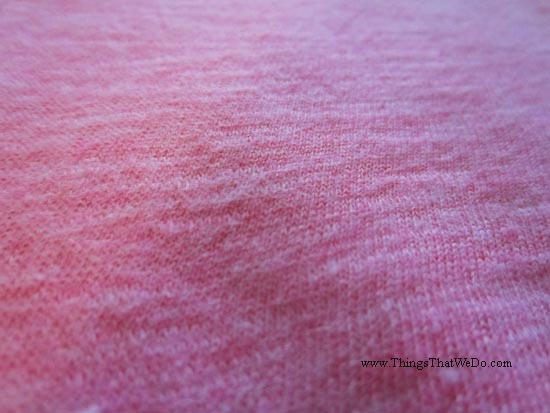 It takes a few minutes but the end result is a shirt that’s in much better shape. 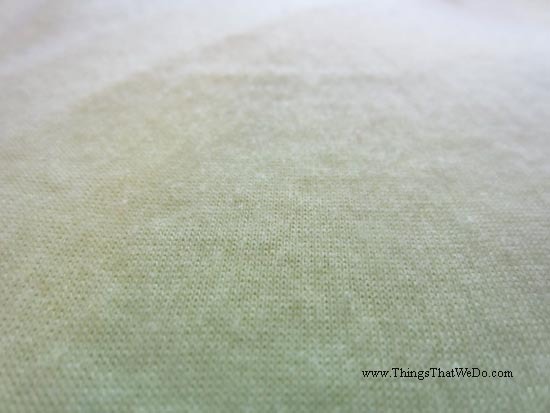 As you can see by the pic, many of the pills are gone and the shirt’s surface is much smoother. 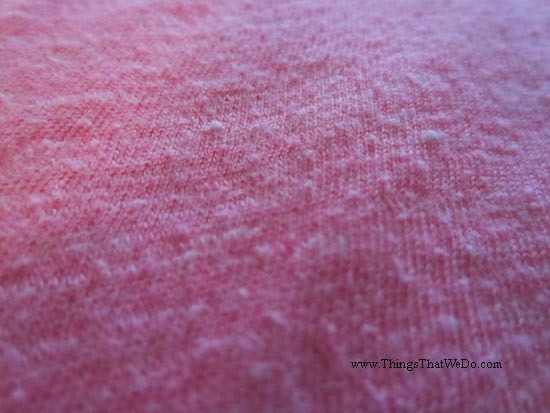 I test it out on another shirt, cotton this time, with its own set of pill problems. With the same ease as before, the Scotch Essentials Sweater Pill Remover does its job and I’m left with a smooth surface. I understand the mechanics. Friction to remove the pills is a brilliant idea. Sure, I’m likely thinning out my shirt in the long run but at least this way, I can still wear it a few more times before it officially quits on me. It’s also probably not for everyone because it does take some time to effectively remove those pesky little pills. 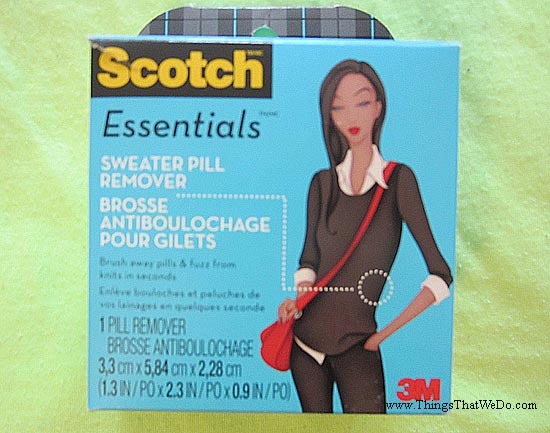 Do I think the Scotch Essentials Sweater Pill Remover will work for every garment? No, I don’t think so. I think a lot of it depends on the size of the pills and what the fabric is made of. Although I didn’t test it out on a giant wooly sweater (I don’t have one), I imagine it wouldn’t work on large size pills. Does it work for me? Totally. So far, I’ve saved a handful of shirts and cardigans that I have yet to find replacements for. Translation: less mall time, less shopping, less noise. I can totally live with that!